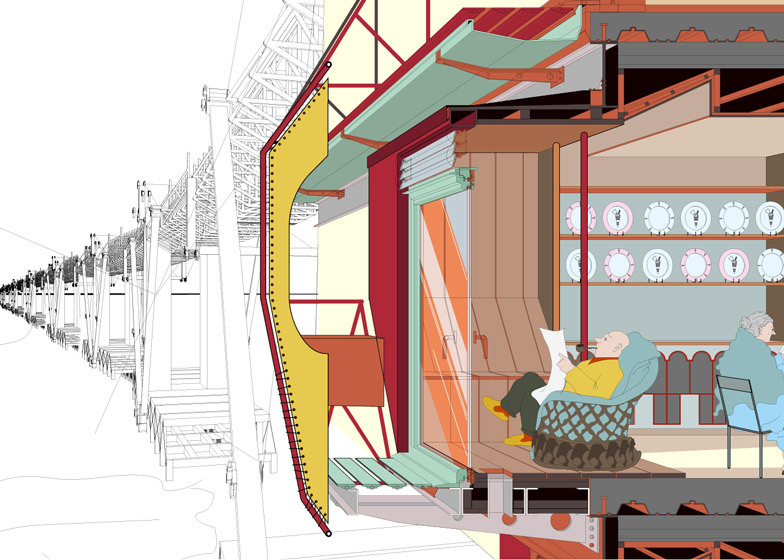 Graduate shows 2015: University of Westminster graduate Freddie Jackson has designed a tidal barrage that can produce energy from the sea, but also incorporates a community of 20,000 new homes. With London's population expected to grow by around 2 million in the next 20 years, MA Architecture students at the University of Westminster were asked to design schemes for urban islands in the Thames estuary – the body of water where the River Thames meets the North Sea. Jackson's project envisions a 5.6-mile-long mega-structure off the coast, which is between six and 20 storeys high. The structure would generate energy from the sea and act as a flood defence for the city, but also incorporate housing and entertainment districts. "I decided to look at an extreme scenario following the trend of building housing development clusters around new pieces of infrastructure," Jackson told Dezeen. "The project suggests that infrastructure can become a richly inhabited environment." Jackson claims the barrage could provide 20,000 new homes and generate energy equivalent to three nuclear power stations, providing up to six percent of the UK's current demand. He based these figures on a study of a similar-sized barrage in the Severn estuary. "It would be a self-sufficient community and power much of south-east England," he said. Jackson designed the structure as three districts. The Epicurean district would house small-scale shops, business startups and markets. The Wharfage district in the centre would feature lanes for ships to pass through, and include short-stay hotels, restaurants and entertainment areas. The Powerhouse district would be the zone for energy production. Through his drawings, Jackson was keen to personify the structure, which he has named Barbara the Barrage. "I wanted to name the barrage as a boat or sea vessel would be named," he said. "It seemed that buildings rarely get personified in this way and it allowed me to present the project as a character." People were depicted in the drawings to show a more garish and dystopian vision of life on the mega-structure. "The inhabitants are self-indulgent and excessive, and are encouraged to be so by the markets and fast food outlets on the barrage," he said. "I imagine the islands may start competing for attention to attract more visitors, which is where the idea came from to show one of the buildings customised as a giant ice-cream," added Jackson, who previously worked as an architectural assistant at British practice Farrells, and cites Terry Farrell's Postmodern designs as one of his influences. "I took inspiration from Postmodern iconography and the reinterpretation of recognisable symbols of our culture, such as the eggcups on top of London's TVAM building," he said. Housing projects around Amsterdam's docklands, which the university's MA Architecture students visited on a field trip, also provided inspiration. "I was inspired by how these communities had become destinations in their own right, and were not desperate to be connected to the city," added Jackson. Other 2015 graduates from the University of Westminster's architecture programme include Liam Atkins, whose project involved a workshop that is part building, part cave, to build props for a fictional series of biblical films directed by Wes Anderson.